Nick Paris is a world-class photographer who is just returning to work after the tragic murder of his lover and partner, Cannon Ashford. Nick has accepted a job photographing an archaeological dig in the Ukraine led by Professor Evan Dyer, a man Nick quickly finds is nearly impossible to resist. Refusing to get involved with another man on the job, he allows himself to be seduced by Rissa Johns, a woman with a dark secret and lethal ties to the Russian mafia. As Evan fights for Nick, and Nick fights himself, both men are embroiled in a dangerous, international plot to steal Evan's finds: the ancient gold of the Black Sea Barbarians. 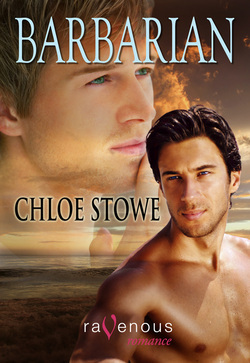 With breathtaking excitement, red-hot passion, and a thrilling conclusion, Barbarian will leave you aching for more! “Could have sworn you promised me a vacation.” Cannon Ashford ducked behind the palm tree as another gardening tool whizzed by his head. “The madman with the machete.” Said machete sliced through the air, taking out two coconuts and the rain barrel at their side. “Consider it a little something extra from your boss.” Nick tossed a crooked smile in Cannon’s direction. A hacksaw flew by. “Not really the time.” “Never is.” One an investigative reporter and the other a world-class photographer, the pair was World Geographic’s most in-demand team. The last month had found them exploring the thirty-three tiny islands of the Republic of Kiribati. The country’s president had recently made international news by declaring that his South Pacific nation would be the first to lose all its land to global warming. The islands were, in effect, sinking. World Geographic had immediately sent their best team to investigate and report. Nick, being one never to turn down an interesting job, had to convince his partner to put off their longplanned vacation for just one more month. Eventually Cannon had caved. The lunatic with the gardening shears had cemented the idiocy of the deal. With the ocean at their backs and endless white sands on either side, they were trapped behind two palm trees, a fuel barrel, and a clump of prickly brush. The islander holding them hostage with his collection of projectile tools sat on his front porch, only fifteen feet in front of the pair. The man was in his fifties, with a lifetime of anger in his arsenal and a well-soused mind as his anchor. He railed against the world with hoe, spade, and shovel. Nick and Cannon had apparently picked a poor time to visit this man’s island. He was the atoll’s sole remaining inhabitant. They hadn’t even made it to the front porch, let alone gotten a word out, before they got pummeled. Their lone saving grace was the fact that the islander was too drunk to stand. So, pinned to porch and palm, the standoff continued. “The lecture on missed opportunities.” With one hand, Nick fiddled with his camera. The fact that he had used just the same argument to get them stuck in this oddly barbaric situation, Nick hoped Cannon would ignore. “I believe that’s how I got you in bed the first time,” Cannon defended. “Was that an insult?” Cannon squinted his blue eyes down at his lover in suspicion. Hitching himself up on his elbows, Nick peeked over the fallen palm tree at their side and grinned. “Could that be the infamous police boat?” While Kiribati had no police cars, they did have a boat. One boat. Nick prayed that that noisy speck of garish colors and flags was it. “Shut up and start yakking.” If there was anything Cannon Ashford could do, it was talk. His silver tongue had saved their asses an embarrassing number of times. Nick saw no reason to change the script now. Cannon laughed as he stood up and dusted the sand off his knees. “One of these days we’re going to have a long talk about oxymorons.” He raised his arms to the sky and took a step toward the police boat. After four weeks, the government knew them well and most likely knew this islander’s oddities as well. Besides, when it came to situations like this, surrender had always been Cannon’s favorite policy. A bullet ripped through twenty-five-year-old Cannon’s brain, killing him before his body hit the sand. Cannon Ashford would have no more days.